8 Essential Social Worker Interview Questions in 2019 - Ready to Answer? Helping the people who were not lucky in their life, doing a job that has a meaningful purpose, and getting a decent salary for doing these things–social work in indeed one the best fields of employment. But how to get this job in an interview? 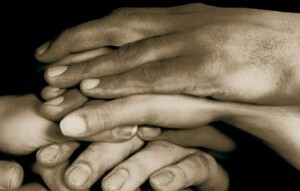 More and more people face adversity each year, and the social sector is growing as fast as ever. It means more job opportunities, but also a tougher competition for you in each job interview. To succeed and start your career in social work, you will need to provide good answers to the questions of the interviewers, and convince them that you have the right attitude to the job, and know why you want to work in the social sphere. Let’s have a look at some questions you may deal with in your interview. Why do you want to become a social worker? Why are you applying for a job in our institution? What is your experience with the target group? How do you plan to build relationship with our target group? Here is a problem we face. Think about a solution to this problem, and describe it to us. Motivation of job candidates is one of the decisive factors in every interview. The interviewers want to hear that you care for their institution, and for the target group. I suggest you to talk about your desire to help people—the particular group of people you’d work with in your job. On the top of that, you should not connect your job choice to the past, saying that you want to work as a social worker because it was a field of your study. That answer would sound like a must, not a desire. Speak with enthusiasm about your mission, and show them that your intentions are correct. You can talk about your desire to make things better in your city, county, or country (and there are plenty of things we can improve), about your wish to help the others, to make a difference in the world, or at least in a local community. Say them that you see a meaningful purpose in this career, and imagine doing it for many years to come. Show empathy for their target group (seniors, unemployed, homeless, orphans, drug addicts, refugees, other groups they work with), and tell them that you believe to have the right personality, skills, and values to help the particular group of people. Alternatively you can talk about their institution, praising them for the good things they have achieved over the years. A brief research you do should help you to find a good answer to this question. Perhaps a local press published an article, describing the activities of the institution? Perhaps they have carried out a particular project that helped the local community? You can praise them for many things–their system of work, their reputation, the values and principles they follow in the organization, etc. You can also say that you like the location of the place, that it will convenient for you to travel to the place each morning. Try to focus on the things you have achieved with the target group before. Did you help some children to find their way in life? Did you help the sufferers to find new hope? Did you hep the homeless to reintegrate into working society? Speak about things you have achieved, and how you have achieved them. Narrate the details. Speak with enthusiasm. Show us that you really care for the target group. And if you have no professional experience with the target group (perhaps you are applying for your very first job), talk about the experience with the people from your personal life (your schoolmate was an orphan, many homeless people live in your street, you visit a nursing home often to meet with your grandmother, your cousin suffers from down syndrome, etc). Experience with people help us to understand their needs and desires. Show us that you understand the target group, and are ready to start working with them professionally from day one. Try to present yourself as someone who wants to work, who likes to work, and who always looks for something productive to do. Look at the job description, list the principal duties, and say you would devote your time to study and research, if there were no other things to do on a given day. Do not forget to list also the “unpleasant aspects” of the job in social sector (for example helping the clients with their personal hygiene, or anything else that feels difficult to you), showing us that you see your job realistically–with both good and bad things that belong to the role. Show us that you are ready to handle everything the job presents. There aren’t many career growth options for most positions in social sector (the few exceptions just prove the rule). And a good social worker (or a person with a good personality for this job) should actually not seek promotion, or a career change. Oppositely, they should be happy with their job, seeing the purpose, enjoying doing the same thing over and over, trying to improve their work with the target group. Good answer depends on your attitude, your methodology of the work, and the philosophy of the particular social work institution you will work for. Many institutions have their own system of work, and the employees are bound to follow the system. Nevertheless, saying that you will always try to think on the same wavelength as the people do (your target group), that you will look at the situation from their point of view, trying to understand their needs and desires, their emotions, and that you won’t try to stand out from them much, will work in most job interviews. Social workers face a lot of challenges in their jobs. Conflicts with colleagues and clients, cases we can do nothing about, clients that just won’t cooperate, and so on, and so forth. Show us that you are ready to address the most common challenges, that you won’t panic in a given situation. Design a simple solution, speak in a calm voice, and admit your inexperience (if you are just starting your professional career). Good social worker should be able to think independently, and decide on their own. On the other hand, the best social work institutions are always a team-effort. Say that you will consult your colleagues, people with more experience, people who have already faced the same challenges. Job interview is a dialogue (or at least it should be a dialogue). Ask questions. Start a discussion. Elaborate on their answers. Each good question shows them that you care, that you want to know more about the things they do, that you are interested in their institution. You can talk about the challenges they face, about the working environment, about the goals they try to attain in the institution, etc. Ellen King devotes her career to helping people to succeed in job interviews for various positions in social sector. She also helps private social work institutions to find the right candidates for the jobs they advertise. 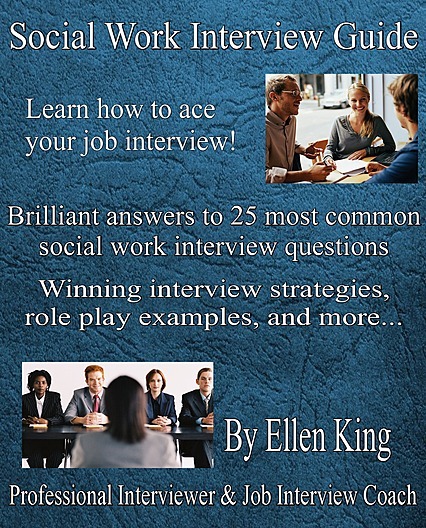 Ellen wrote an excellent eBook, the Social Work Interview Guide, in which you will find brilliant answers to twenty-five most common social work interview questions, and much more. You can check the samples from her eBook here: https://socialworkinterviewquestions.com/social-work-interview-guide-ebook/. Body language in an interview – What do your gestures and movements say about you? Can we control our non-verbal communication? The way you walk, shake hands, the chair you choose in the room-it all says something about you. Learn more about your body language, and how to “say” the right things. How to dress for your interview – Four rules to consider when choosing clothes to wear. 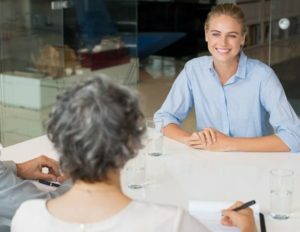 A simple article that will help you to finally decide what to put on for your interview. Skype interview tips – Interview for a job on Skype, or online? 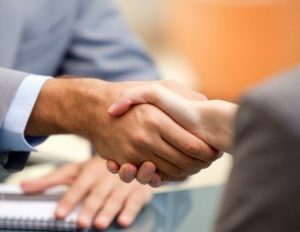 Learn how this interview differs to the typical face to face meetings, and make a great impression on your interviewers.